When World War One broke out in 1914 Sir Arthur Conan Doyle tried to enlist in the military stating, “I am fifty-five but I am very strong and hardy, and can make my voice audible at great distances, which is useful at drill.” His offer was refused but that didn’t stop Sir Arthur from contributing to the war effort in every way possible. In fact, he was active in defense of his country even before war broke out. Conan Doyle had a strong feeling that conflict was coming after a 1911 automobile event. That year he took part in the International Road Competition organized by Prince Henry of Prussia. Known as the Prince Henry Tour, this contest was designed to pit the quality of British automobiles against German automobiles. The route took the participants from Hamburg, Germany to London. Conan Doyle and his wife, Jean, were one of the British driving teams. Each of the ninety cars involved in the contest carried a military observer from the opposite team. 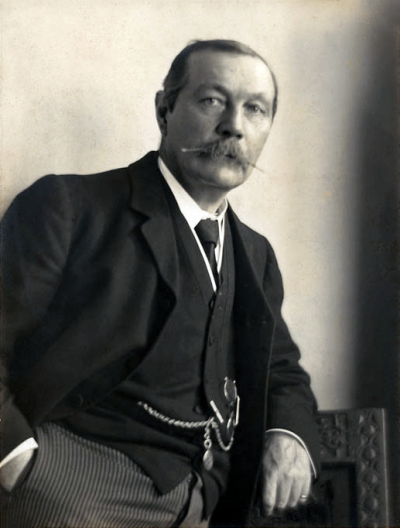 Conan Doyle was surprised at the hostile attitudes of many of the German observers. He also heard much talk about the inevitability of war. The British won the competition, but most of the participants came away with the conviction that war was near. Alarmed by what he’d seen in the Prince Henry Tour Conan Doyle began to study German war literature. He saw that the submarine and the airplane were going to be important factors in the next war. He was particularly concerned about the threat of submarines blockading food shipments to Britain. Conan Doyle endorsed the Channel Tunnel proposal as a way of safeguarding Britain from this threat. The tunnel would run between France and England. Conan Doyle argued that the tunnel would ensure that Britain couldn’t be cut off from the rest of Europe during wartime and would provide increased tourism revenues during peacetime. Convinced that this was a vital precaution Conan Doyle eventually took his idea to the public in the form of a story. “Danger! Being the Log of Captain John Sirius” appeared in the July, 1914 edition of the Strand Magazine. The story dealt with a conflict between Britain and a fictional country called Norland. 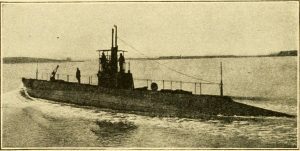 In the story, Norland is able to bring Britain to its knees by the use of a small submarine fleet. Sadly Conan Doyle’s warnings were ignored, at least by the British. German officials were later quoted as saying that the idea of the submarine blockade came to them after hearing Conan Doyle’s warnings against such an event. How much of that statement was truth and how much was propaganda designed to cause conflict within Britain is not known. When war finally did break out in 1914 Conan Doyle was fifty-five years old. His age didn’t stop him from trying to enlist in the military. Despite his generous offer and his loud voice Conan Doyle’s application was denied. However he was determined to help the war effort in any way possible. He next set about to organize defense units comprised of civilian volunteers. The War Office ordered those units to be disbanded and replaced them with units that were centrally administered through their office. Conan Doyle’s unit became the Crowborough Company of the Sixth Royal Sussex Volunteer Regiment. He was offered the command position in the new battalion, but Conan Doyle refused. He wanted to show his countrymen that all were equal in the defense of Britain. 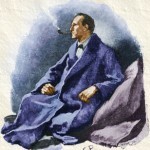 He entered the group as Private Sir Arthur Conan Doyle. In the first few weeks of the war three British cruisers were lost. The 1,400 men aboard the cruisers were lost as well. Conan Doyle thought the loss of life was preventable. He wrote to the War Office urging that each sailor be given an “inflatable rubber belt” to assist the sailors in case their ships went down. Sir Arthur was never reluctant to use his personal popularity when fighting for a just cause. Therefore he also sent letters to the press proposing these very same ideas. He knew that while the War Office might ignore the voice of one man, it couldn’t ignore the voice of public opinion. His plan worked. The government soon ordered inflatable rubber collars, the forerunner of today’s life jackets, for the country’s sailors. Conan Doyle would use this same tactic later when advocating that lifeboats be carried on military vessels. He also urged that body armor be issued to front line soldiers. While World War One still raged on Conan Doyle began work on The British Campaign in France and Flanders. It was an extremely detailed history of the war. Conan Doyle was very proud of it and went to great pains to make it as accurate as possible. He gathered material for the book from any sources including the British military. However the book wasn’t as balanced as it could be. Conan Doyle totally trusted the material he received from some of his sources. The bias of these sources made its way into the book. 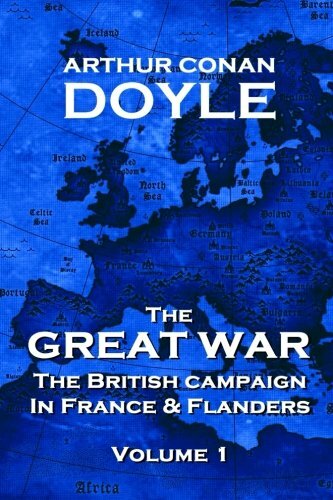 The British Campaign in France and Flanders was initially published in six volumes. The first volumes didn’t sell well because they were published when the war was still being fought. The public wanted to hear about the day’s battles rather that read a history of the early days of the war. After the war ended the public, possibly wanting a break from death and destruction, had little interest in reading about the conflict. 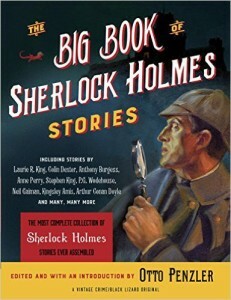 Conan Doyle said the book was, “an undeserved literary disappointment”. Sir Arthur’s suggestions on warfare were thought of as intrusive by some members of the British government. However he had some supporters as well. One of those, the First Sea Lord of the Admiralty, would play an important role in World War Two. The man’s name was Winston Churchill.